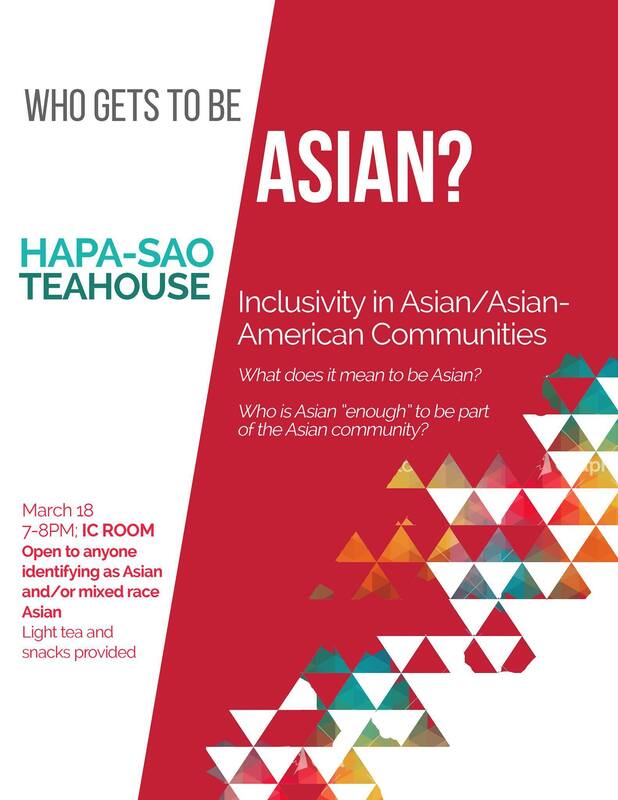 On Friday, March 18, Hapa, a club for Asians of mixed heritage, and SAO (Swarthmore Asian Organization) collaborated to host a teahouse discussion about who gets to be Asian. Many Asian groups on this campus feel that inclusivity is an important topic to discuss. 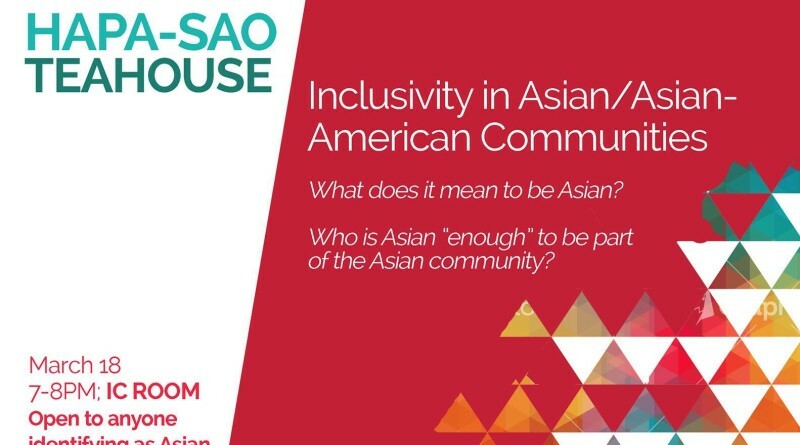 Some people who do not identify as East Asian do not feel included in SAO, which is supposed to be the umbrella group for all Asians at Swarthmore. According to Hapa, there are many reasons why some people don’t feel included in Asian groups or Asian communities. Another factor that influences inclusion is appearance. The hosts from Hapa, Emma Lewis ‘18, Iwasaki, and Sonkowsky, thought it was important to have a discussion about hapa people’s place in the wider Asian community because this topic is generally not talked about. “A lot of people who aren’t hapa don’t think about hapa issues,” Lewis said. Iwasaki presented another reason why this teahouse was hosted. The attendees of the teahouse broke into small groups after introductions so discussions could be more personal and intimate. The hosts gave each group a list of discussion questions to respond to. During the small group discussions, “there was a good range of learning and bringing things to the table,” Lewis said. Others who attended this teahouse also thought the discussions were successful. “I’ve always enjoyed the cozy atmosphere of SAO teahouses and I felt that breaking into smaller groups after introductions was conducive to conversation,” Shinae Yoon ‘16 said. Many people decided to attend this teahouse because they were interested in the topic of inclusivity and how it affected them or the Asian community. “I was also interested in engaging with the question [“Who Gets to Be Asian?”] posed by Hapa and SAO,” Yoon said. Other people, such as former SAO president Oscar Chen ‘16 wanted to see whether SAO is evolving to be more inclusive and less dominated by East Asians. “As a Senior, I wanted to see how SAO has evolved and changed and see where the temperature of discussion is,” Chen said. “SAO has often been guilty of not being inclusive of multiple Asian identities. Instead of saying we need to be more inclusive, we can build bridges, which is something new I have noticed. One goal of this teahouse was to ignite discussion about inclusivity into the wider Asian community for those who feel excluded. “We can hopefully improve inclusivity in the Asian community, get more people involved, hear more people’s voices, and make the communities more comfortable for other people,” Iwasaki said. “Being Asian is self-identity,” said Iwasaki. However, Sonkowsky said, not everyone can self-identify as Asian. “Someone who doesn’t have that background at all, however that is defined, can’t just step in and pick and choose what parts of being Asian they want without going through all the struggles as well,” Sonkowsky said. Chen echoed this statement, adding that the label “Asian” is supposed to be an umbrella term, but that it fails to include all groups, especially South Asians and Southeast Asians. The teahouse was intended to begin a discussion on inclusivity. Organizers said there is still more work to be done. “I think that it might be useful to focus the inclusivity topic in more specific areas,” Iwasaki said. Iwasaki and Chen suggested that SAO collaborate with Deishi to talk about where South and Southeast Asians fit in in groups dominated by East Asians. Hapa hope to counteract what they perceive as a lack of education on hapa topics by hosting more events. “Engagement with the wider Asian community is important [for Hapa],” Sonkowsky said. According to Lewis, Hapa plans to address interracial marriages next. “We were thinking of having a screening of Seeking Asian Female, which is a movie that talks about interracial dating as it concerns the Asian American community,” said Lewis. This is especially important to Hapa because many of its members are byproducts of such relationships. Featured image courtesy of SAO/Hapa.